Do you want to know how to get to the incheon chinatown? There are many ways you can get to incheon chinatown such as public transportation (bus, subway / metro), taxi and Blacklink limo/transfer/shuttle service. Don't sweat outside waiting for other transportation with your luggage. Make a round trip reservation with Blacklink as you plan for your trip. It is easy, convenient and available 24/7. Then, the assigned Blacklink driver will greet you at the arrival and will drive you to the incheon chinatown. You can use Blacklink for not only hotel but also Gimpo Airport (GMP), Myeongdong, Jongno-gu, guesthouse, resort, airbnb, lodging and anywhere you want to go in Korea. Check out Blacklink customer review posted below. Incheon Chinatown provides people with various food, attractions. In Incheon Chinatown, there are many food such as Sweet and Sour pork, Assorted Seafood and Vegetables with Mustard Sauce, Noodles with Black Soybean Sauce(Jajangmyeon), Fortune Cookie, Mooncake, Gongal Bread (Pita Bread) and so on. On the busy streets of Korea’s biggest Chinatown in Incheon stands Gonghwachun, one of the most popular Chinese restaurants among tourists to the area. And Moon Cake is a kind of bread, which is baked in a round moon-shaped food. It is a symbol of China's traditional Thanksgiving foods like a rice cake in Korea. And Gongal Bread (Pita Bread) is a kind of Chinese bread. It is called a Chinese pancake. Inside the bread, it is empty and the only outer part of the bread is inflately baked. And, Incheon Chinatown provides many places to buy various things such as Chipao, Antique Pottery, Traditional Tea, Jewelry and Accessories, Tea cup set. Chipao is a China's traditional costume. All men and women can wear this costume. but, It is usually referred to a dress for women. Also, Incheon Chinatown has many attractions such as Paeru, 義善堂(Chinese temple), History of Three States Mural Street, Korea and China Cultural Center, etc. Paeru is a Chinese traditional gate installed in the village entrance, '義善堂' is temple of Chinese, History of Three States Mural Street is decorated with murals with the explanation of important scenes of History of Three States. 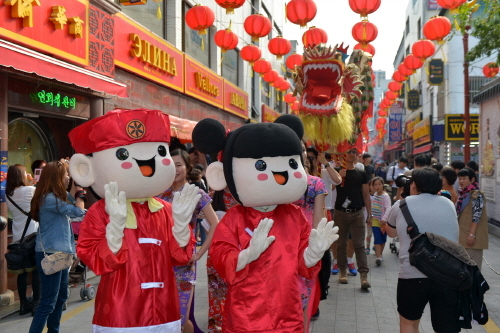 Incheon Chinatown is located close to other outing such as Freedom Park, Songwoldong Fairytale town, Wolmido, and so on.